Search for all "Influenza M1/HLA-A2 Complex"
Mouse anti Human Influenza M1/HLA-A2 Complex 405H1.01. DDX0270P-50 / DDX0270P-100 Purified: Flow cytometry, ELISA. DDX0270A488-50 / DDX0270A488-100 Alexa-fluor®488: Flow cytometry. DDX0270A546-50 / DDX0270A546-100 Alexa-fluor®488: Flow cytometry..
DDX0270A647-50 / DDX0270A647-100 Alexa-fluor®488: Flow cytometry. DDX0270B-50 / DDX0270B-100 Biotin: ELISA. *This monoclonal antibody may be used between 5-20 μg/ml. 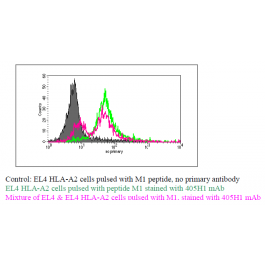 In order to generate this mAb, the HLA.A2 heavy chain and human 2-m were produced in bacteria, purified and covalently bound to the immunodominant HLA.A2 restricted peptide 58-66 of the influenza virus matrix protein (M1p). Correct refolding was confirmed by staining specific CD8+ CTL clones with the biotinylated recombinant chimera that had been tetramerized with PE-streptavidin. Balb/c mice were immunized with the chimera and hybridomas were tested by a differential chimera-based ELISA containing M1-HLA.A2 versus HIVgag-HLA.A2 and empty HLA.A2 constructs. 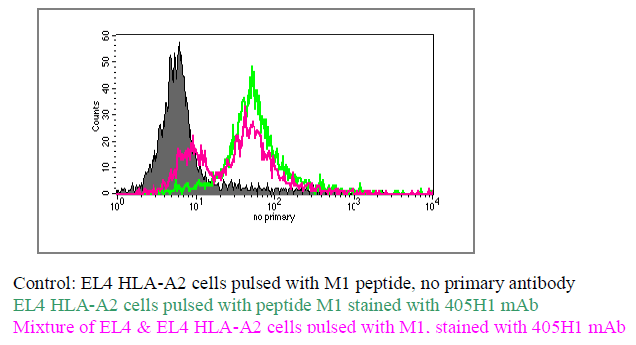 405H1 mAb was found to be specific for M1-HLA.A2 with a Kd = 3,3.10-10 M. 405H1 represents a valuable tool for studying the processing and direct or cross-presentation on MHC-I molecule. Human extracellular/M1 HLA neuropilin-1(epitope in extracellular domain).